A few days ago I received a mailer from the Pittsburgh Comicon - the cover image changes from year to year, but it's amusing how those at the con have managed to put out the same basic show advertisement since I first attended with my dad nearly 15 years ago. I remember being so excited getting this in the mail when I was younger - I even took a copy one year and had golden age Green Lantern creator Mart Nodell sign it (a story for another time to be sure). Heck, I might even still have it stored away in a box somewhere. Anyway, this year's mailer features a cover by Tom Mandrake with the Spectre, a character he's known for, and...a skull. This is quite a thrill, of course. Seeing your name in print is always fun (unless you're, I don't know, getting arrested and it's in the police blotter or something), and this time is no exception, though it's a little disconcerting to think that everything I've worked so hard to accomplish in the realm of comics can be summed up (rather nicely at that) in just about six full lines of text. I suppose that most of the comic professionals got just as much space, so perhaps this makes it look like we've had the same number of accomplishments. Two sides of the same coin, perhaps. Once again my "right next to Scott McDaniel" thunder was stolen by Jeff McComsey, the man who shares the same first seven letters of my name. Perhaps I will meet him at the show, and we will fight. But perhaps not. The past few weeks have been, in a word, busy. 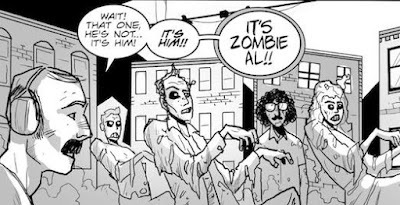 It's midterm time at school, my brother-in-law got married, I sent Teddy and the Yeti #3 off to the printer (forgot to mention that, huh? ), filmed another episode of Franks and Beans, and what's my reward for all of this? Apparently lots and lots of comic book related presents, courtesy family and friends. Oh, and it was my birthday, too. Among the awesome things I got are those pictured above. My buddy Larry got me a Marvels hardcover, a Fantastic Four plug &; play video game and (as a gag, I assure you), the first issue of the Madballs comic series from Marvel's Star Comics imprint. They've started to reissue Madballs since their heyday in the 1980s and, as I had a bunch of the originals, I plan on getting some of the new ones. But I haven't yet. But I will. Maybe. I also managed to snag the next book in Scott McCloud's instructional series, Reinventing Comics, and a Time Capsule backup for the Mac. Now I can actually save my progress and not kill myself if the computer ever crashes and I lose all of my comic book work for the last three years! The key ring comes off to make it like an action figure. I'm not sure which way I'll use it yet. Finally, Batman: Year 100 came in the mail on Saturday, which rounded out quite the haul for me on my...uh...19th birthday. Right. Oh, and I got an ice cream cake that had "Beast Wars" written on it. Dairy Queen was pretty confused about that one. I need a small favor of you, my oh-so faithful readership (and also the people who decide to leave notes in Chinese every once in a while). I'm in the early stages of putting some ideas together with artist Mario Wytch, who did the Faith and Charity pages I posted a while ago and drew an awesome pinup for Teddy and the Yeti issue #2. The basic design for the main character of this project is what you see above - what we haven't been able to decide upon is the color scheme for said character. I'm looking for opinions. Which (if any) do you like best? Which would be a horrible choice? I'm asking this because I can't seem to come to any conclusions myself. I'll tally down the answers, and whoever picks the color we ultimately choose wins nothing. This ain't no soccer game "two-dollar for as long as your arm" ticket raffle! But really, opinions would be helpful. 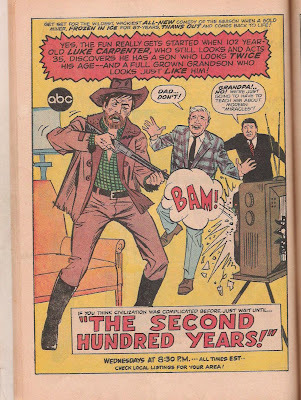 I stumbled upon a copy of America's Best TV Comics recently and snatched it up because it is relatively rare and features an original Stan Lee/Jack Kirby Fantastic Four story. 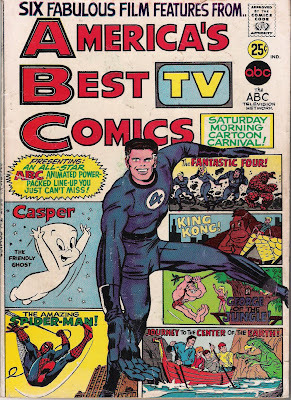 This 1967 oddity was produced primarily by the ABC television network to promote their Saturday morning cartoon lineup, which featured Marvel properties like the FF and Spider-Man along with other cartoon classics like George of the Jungle and Casper, the Friendly Ghost. The Second Hundred Years, according to those cagey geniuses at the Internet Movie Database, as well as...well, this ad in front of you, is about a prospector who gets frozen in ice, only to be revived 67 years later, and - get this! - he has to ADJUST TO MODERN SOCIETY! Holy crap, what a concept! Okay, okay...I'll admit that this isn't the worst idea I've ever heard for a television show, and the concept of the man's son being older than he is is kind of funny...I guess. What I don't get from the ad is this - why would you let your recently returned grandfather who has been obviously traumatized and absent from the world for two-thirds of a century carry a gun around the house? And better yet, why would he just randomly decide to shoot the television? You'd think that, rather than remarking that we're gonna have to teach grandpa about "modern miracles" (we apparently have low standards for how we define miracles), we might have given him the tour before we left him alone? Absurdity, I tell you! Monte Markham, who played both grandfather and grandson in this one-season series, has acted fairly regularly since 1966, but unless I'm mistaken, this show is STILL the most work he's done on any one production other than - get this - Baywatch. A jack of all trades, it seems. I got an envelope in the mail on Wednesday from the Pittsburgh Comicon - it contained, among other things, a flyer promoting the show and its many guests. I've scanned and posted it above for all to see. Do me a favor and click on the picture to see a full-size version, then let me know if any of the names stand out. Yes, that's right, sandwiched in between the names "Adam Mayfield" and "Jeff McComsey" (a bit too close for comfort, Mr. McComsey...you stole my spot right before McDaniel!!) is the one and only author of Teddy and the Yeti. This is sure to bring the fans in! Wagon Wheel Comics will be at booth S088, situated right by two necessities - bathrooms and food. I suppose time will tell if this is good placement or not, but at least I'll know where they are. Only about a month until the show! I hope to see everyone (in the world) there! I'll probably regret this later. Please file the above under "Stuff I theoretically like but will complain about when I have to pay for it". Yes, yes, I know...my category headings are atrociously long. According to the teasers Marvel has been slowly leaking, the Thing will be part of the New Avengers book once it relaunches in a few months. This is great, because I love the character and think that he should get more exposure. The Fantastic Four in general seem to get pushed to the back burner when it comes to books that are promoted, really, but it seems a particular affront to the Thing because he DID have great marketing power - as much as Spider-Man and Wolverine - in the 1970s and 80s, when he had his own title (either Marvel Two-in-One or a self-titled book) and was more or less the star of every other issue of the FF. 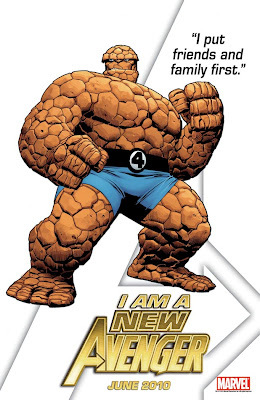 So it's nice to see my favorite member of the Fantastic Four getting to be a part of one of Marvel's better selling titles. On the other hand, I think I just heard my wallet cry. The Avengers in all their iterations (New, Secret, Dark, Cheddar) are so overexposed - they get showcased in a great number of books, even if they're not necessarily Avengers books to begin with. It seems that I always do this to myself: I wish for more exposure for the comics and the characters and the creators that I enjoy, but when more DOES show up, I always resent it a little. Nearly every issue of the Fantastic Four has shipped with two or more covers for the past half year or so. At first, this was novel. Now I'm ready to start knocking things over. My last post mentioned a little "inside joke" I snuck into the "Presidents and Precedence" tale that leads off our third issue. That joke was subtle and had some great backstory regarding my relation to Civil War General George McClellan, a story which I think was worth telling. "Presidents and Precedence" has another hidden joke in its pages, and I'd like to say that there was some deep meaning behind it as I feel I've set the bar at least somewhat high; however, they can't all be winners. The title of this series, of course, is Teddy and the Yeti. In the scene pictured above, where the Yeti is being attacked by mechanical constructs of historical figures, we see none other than a representation of 26th U.S. President Teddy Roosevelt (Duane drew him biting the Yeti, which I think is spectacularly funny). Teddy...and the Yeti. Get it?! I know...this one was much more obvious. But I've got the original art to the page hanging in my house, and I still chuckle at it every time I see it, which it quite often. Maybe it's where that FATE Magazine article came from. 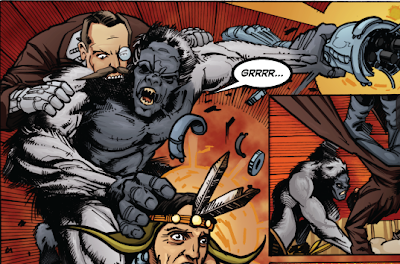 The upcoming third issue of Teddy and the Yeti opens with a colored version of the story "Presidents and Precedence" - a seven-page tale that was first published (in black and white) in the Josh Howard Presents: Sasquatch anthology. The first page of this story features the iconic (?) image of the Yeti knocking the head off a robotic Abraham Lincoln. The Yeti soon discusses her growing dislike for the 16th President of the United States, surely aggravated by the fact that robot Lincolns keep attacking her, mentioning that if she were alive at the time (and, presumably, allowed to vote) she would have voted for "the other guy". Ted retorts by asking if she even knows who "the other guy" was, which, of course, the Yeti does not. This scene gave me a measure of satisfaction beyond its surface, as "the other guy", at least during Lincoln's bid for a second term in office, just so happens to have been an uncle of mine. 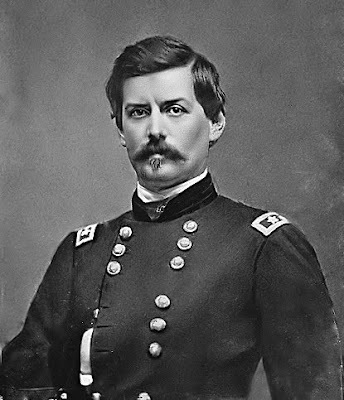 Well, a great-great-great-great-whatever uncle of mine: Civil War General George Brinton McClellan. Let me say that it is difficult to look back at the history of the United States and say "boy, I wish Uncle George had won the election...over Abraham Lincoln." Lincoln has earned his spot on Mr. Rushmore, for sure, as a liberator and a great leader. It's hard to think of what this country might have become without his steady, guiding hand just when we as a people needed it most. The Presidential election of 1864 was won by a landslide, and really, how could it have been otherwise? McClellan had no chance, and it was for the betterment of the country that he lost. That being said, seeing the Yeti punch robot Lincoln in the head was somewhat cathartic, in a twisted way. Lincoln and McClellan had a strained relationship, with Lincoln famously writing that since the General was not using the Union army, he "would like to borrow it for a time." McClellan, in his own display of insubordination, once rode his horse into the White House. Into the White House! Imagine something like that happening today. Perhaps because of this feud, and certainly due to his hesitant nature in battle (he'd often defeat the Confederate forces and then hold back, thinking the enemy was trying to draw him out into a trap, when in reality they were just retreating), McClellan isn't given what I think is his just due by a lot of the history books. I think this is unfair - and I'll admit that being related to the guy has something to do with it. But if you read about the man, one thing that inevitably comes up is how popular he was with the soldiers in his command: this is what he based his '64 Presidential campaign on. I think that caring for the welfare of those underneath you, not wanting to have men slaughtered needlessly, is something that should be admired, even if it was sometimes too cautious an approach for an all-or-nothing struggle like the Civil War. McClellan's story isn't told very often anymore - most people don't realize that Ulysses S. Grant wasn't the only general to command the Union Army - but I'm proud of him, in my own way. Losing the election didn't seem to keep him down, either, as he was elected governor of New Jersey in 1878. His son, George Jr., was a member of the House of Representatives and the mayor of New York City in the early 20th century. And I write a small press comic book! Sigh. In case anyone is wondering why my last name is "McClelland", not "McClellan", well...the spelling was a bit more "optional" in the 19th century. Some people kept the 'd', some people dropped it. I have no idea why. I don't dwell on it often. A few years back an editor at Marvel Comics (perhaps you’ve heard of them) started his own comic book review company. For a price, he and those working with him would evaluate your book and let you know if it stood a chance of success in the marketplace. He used a sliding scale to illustrate the amount of feedback you’d receive: to get a thumbs up or thumbs down would cost you a certain amount, to get personalized comments would cost more, to get bulleted suggestions would cost even more, and so forth. One of his selling points was that “most comic book companies print one issue of one comic and then go out of business” which, obviously, was oversimplifying things, but I suppose he thought that his guidance could increase a book’s chances of survival in the volatile comic book marketplace. 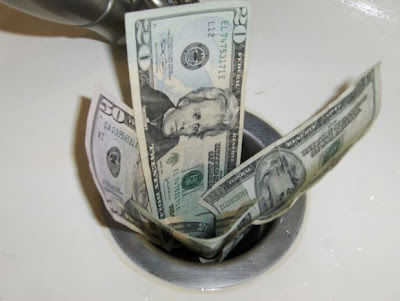 For my part, it seems that if a small press company goes out of business it might be because someone is spending money unwisely, perhaps by throwing needed capital at an editor to tell you if your book stinks or not. But that’s just me (and before anyone gets the wrong impression, no, I did not submit Teddy and the Yeti to that service, which has been out of business itself for quite some time, as far as I know). By this logic, Teddy and the Yeti has been around twice as long as it was supposed to, and in another month or so (I've been working hard on getting it done, folks) it'll be THREE times as long! The editor at Marvel was right - publishing comic books is a tough business - which is why I'm so proud of everything T&Y has accomplished so far. But perhaps one of the reasons I've been able to publish three issues is that I haven't tossed my money DIRECTLY out of a window. I'm a huge fan of anything Alan Moore writes (I know, that's like saying you're a fan of the Beatles...it's kind of obvious), and even though I have DC Universe: The Stories of Alan Moore and it includes the 1988 Batman classic The Killing Joke, I was still enough of a sucker to make sure I got the 20th anniversary "deluxe" edition soon after it came out. I finally got around to unwrapping the plastic cover and checking it out. 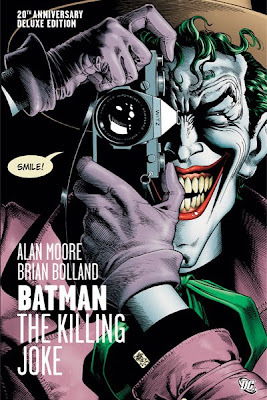 Artist and collaborator Brian Bolland completely recolored the story and there are a few extras included, but this story is, for the most part, The Killing Joke repackaged. I will agree with popular sentiment (and Moore himself) that this isn't my favorite/the best story by Alan Moore, and it's probably not even the best Batman story I've ever read - though I couldn't tell you what is - but it's hard to argue that this story hasn't had its affect on Batman's supporting cast and perhaps the Joker's persona as a lunatic. I will say that what continues to stand out to me regarding this story isn't contained in the fictional Batman/Joker tale - it's how much Brian Bolland always mentions how he dislikes the book. It's like he can't stand it! I'm not sure why this rubs me the wrong way as it does. Certainly the man is welcome to his opinion, and as the visual talent behind the story, I'd say that his thoughts on the subject are worth more than mine, anyway. But if the guy has had so many problems with the story, why does he keep coming back to write about it? Every time I've heard him speak on the subject, he always talks about how the story was his idea - he asked Moore to write a Batman story featuring the Joker - but the end result wasn't really to his liking. He'll mention the Batman/Joker laughing scene at the end (a funny joke, but admittedly a strange ending) doesn't sit well with him. But I've never heard the man offer up his own thoughts on how he would have taken on the story. The nature of collaboration - even collaboration with Alan "TerriBeard" Moore - is such that there are some disappointments along the way. 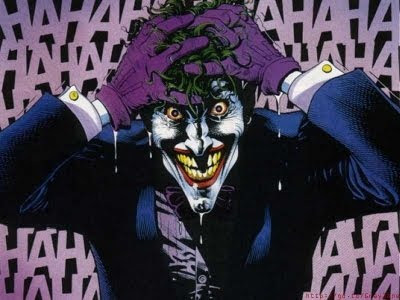 Brian Bolland is one of the best cover artists in the business, even more than 30 years in, but he's probably best known for The Killing Joke. I hope that I don't have something I'm so disappointed in define my career, because from reading everything Bolland writes on the subject, it must be pretty awful. We live in a vast, amazing, incredibly diverse world. It's true that we don't take care of it like we should, but it's still nice to think that one day we as a species will get out collective acts together and become the stewards we were meant to be, so we can enjoy the world and all it has to offer, such as the newly discovered yeti crab. 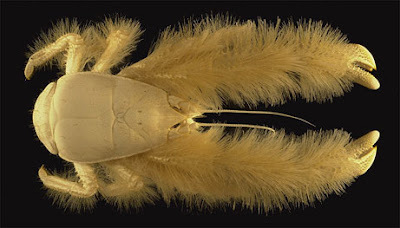 Discovered in 2006, the yeti crab is a blind crustacean with hairy arms that lives in the Pacific Ocean around hydrothermal vents in the ocean floor. 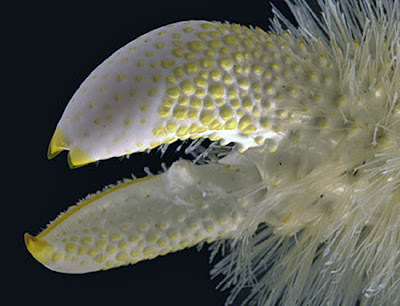 Tiny bacteria live on its furry appendages, and while their exact purposes are unknown, it's speculated that they might help protect the yeti crab from toxic fluids that rise from the volcanic vents. I find it funny that while the yeti is a mythological creature, springing out of folklore, a creature with a derivative name is alive and well, scuttling along at over a mile deep in a place even more remote than the Himalayan Mountains. If it was at all ethically sound and financially possible for me to keep a yeti crab in a tank at my house, I would, but it's neither, so I'll have to be content to love this mysterious creature from a distance. I used to have a MySpace page. I guess I technically still do, though I don't update it anymore...and haven't in a few years. I know, it's sad. Facebook is the place to be now, as it turns out that MySpace was NEVER cool, but I'll bet that the Grim Internet Reaper will one day come for all of today's hip social networks. Every once in a while I venture back to the old haunting grounds just to see if it's still there (it is), and if I'm REALLY bored, I re-read some of the blogs I uploaded to that site. Don't judge - it's not becoming of you. Back in April of 2007 I wrote a big long passage all about Star Trek, and I thought it'd be fun (remember, it's relative) to repost part of it here for posterity, because everyone knows that this blogger site will last forever. Star Trek has had a number of comic adaptations and original stories...but rarely do they catch my eye. You can read more of Jeff's old crap here! 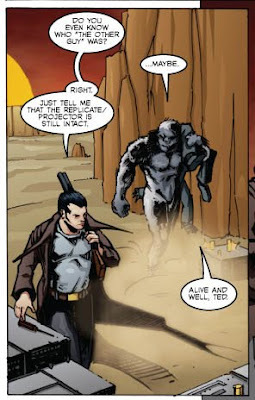 Star Trek comics are pretty common - what's uncommon is to find one that's at all good. But in the early '90s, Peter David had a run on the comic based around the original series, published by DC. I picked up most of that run (15 issues or so) for cheap and really enjoyed it, and I recently completed my search for that particular selection when I bought (also for cheap) the first and second annuals. Peter David is probably one of my favorite writers, and he hasn't just worked in comics - he's also a published novelist and has worked on a few television shows as well. His biggest strength and weakness, in my opinion, revolve around the subplots in the books he writes. He weaves countless backstories and supporting characters into all of his books, giving a fullness to what could otherwise be a sparse cast, but at times those background stories, as they keep evolving and growing, can take away something from the primary action that we should really be focusing on. His run on Star Trek wasn't any different - superb at times, but a little distracting in some other instances. 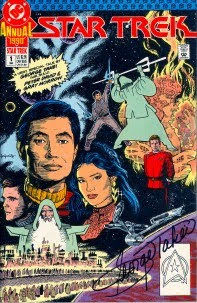 The first Star Trek annual, published in 1990, had the distinction of being co-written by George Takei, Star Trek's own Mr. Sulu. The story itself is not much to talk about - it's serviceable, but not superb by any means - but seeing the fact that it centers around Sulu's infatuation with a female officer - his unrequited love and the tragedy that it spawns - makes me chuckle a little after Takei's recent "coming out" party. I know, I know - just because the actor is gay doesn't mean the character is (we even saw Sulu's daughter in Generations! ), but still. Ever just decide to go an search through the United States Copyright Office's files? Sounds like fun, huh? Well, it's not, and shame on you for thinking so - unless you have a copyright on file, in which case it becomes LOTS OF FUN (trust me on this). The above screenshot is from the Copyright Office's website, where it lists Teddy and the Yeti and lots of information regarding it - publication type, concept title, print date, creator history, date of birth, my (former) address...holy crap, should all that stuff be on the Internets for anyone to see? Apparently so, says the government. Oh well, says I: now I have a record that says I existed on file in a governmental office. And I think that's just swell. A while ago I had a Yeti doll made by someone I met on Etsy, the place where people go to sell homemade sweaters made out of hair and such. I wanted to make some changes to the look of the doll, so I contacted another crafty person to incorporate some of those new ideas. The result is to the left, and I will say this: we're getting close. There are going to be some new changes - I'd like there to be a little more white fur around the face, and we might tweak the mouth a little, but I think we're maybe one step away from having a Yeti doll that can bear the name "OFFICIALLY LICENSED" at some point. Yes, all of the letters will be capitalized. Once these are done and I'm happy with them, I'll try to get them up on the website if it's feasible. I think that if I ever sell one, though, it'll probably be at a convention. It just seems to be more of a "convention" item. Check out the artist's Etsy page here!